The Times salutes a San Francisco pass-rusher, disappointedly shakes its head at the Los Angeles defensive line and previews the best (and worst) games of the week in the NFC West. The Los Angeles Rams are no longer undefeated. But, in the chase for the NFC West crown, it probably doesn’t matter. While the Rams prepare for a playoff run, the Seahawks hope to hang on to a wild card spot and the 49ers and Cardinals eye the upcoming NFL Draft, take a look at this week’s NFC West Awards. 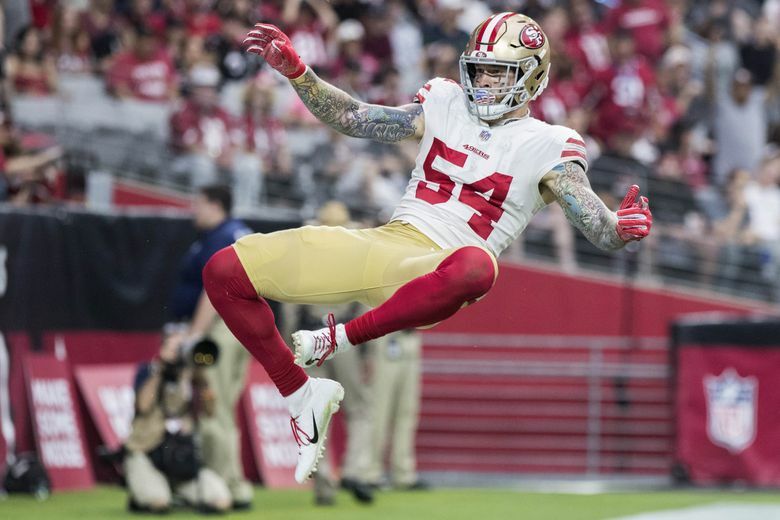 Most valuable player: DE Cassius Marsh, San Francisco 49ers. The 49ers defense manhandled its regional rival — the Oakland Raiders — last weekend, limiting Derek Carr and Co. to three points and 242 total yards. A former Seahawk, Marsh was the biggest factor in that performance, finishing with four tackles to go along with three quarterback hits, 2.5 sacks and two tackles for loss. That was a relatively unexpected outburst for the 26-year-old Marsh, who had just one sack in 2018 going into the game. But then again, these are the Oakland Raiders, so nothing should be totally unexpected. Least valuable player: Tie, Los Angeles Rams entire defensive line. You know that fearsome Rams defensive line? The one that features all-pro defensive tackles Aaron Donald and Ndamukong Suh, to go along with a new acquisition in defensive end and former No. 3 overall pick Dante Fowler? Well, that group finished with zero — yep, z-e-r-o — sacks in a 45-35 loss at New Orleans last weekend. Sure, Donald and Fowler each had a tackle for loss, but those were the only two TFLs Los Angeles compiled. And sure, New Orleans touts perhaps the premier offense in the NFL and Drew Brees may be this season’s NFL MVP. But those are the games a renowned defensive line needs to show up for, and the Rams didn’t show up last weekend. Spotlight statistic: Quarterback Nick Mullens had a quarterback rating of 151.9 in the 49ers’ 34-3 win over the Raiders last week, the highest rating for a player with at least 15 attempts in an NFL debut since the 1970 merger. That’s already plenty remarkable, considering Mullens entered the game as a largely unknown rookie and former undrafted free agent. But consider, also, that C.J. Beathard — who started the team’s previous five games, all losses — accumulated a quarterback rating of 81.8 during that time and threw seven interceptions. Unsurprisingly, Mullens earned another start against the Giants on Monday night. Game of the week: Seahawks at Rams, 1:25 p.m. The Seahawks nearly pulled a significant upset in the first match up this season, driving to the Rams’ 32-yard line in their final drive before penalties punctured their chances and they ultimately fell 33-31. Seattle is holding onto some narrow hopes for a wild card berth, while Los Angeles is looking to rebound from its first loss of the season. In other words, there’s plenty on the line on Sunday afternoon. (Worst) Game of the week: Giants at 49ers, 5:15 p.m. Monday. Are you ready for some football? No? It’s hard to blame you. ESPN will trot out one of the least intriguing match ups in the history of Monday Night Football next week, as the 2-7 49ers take on the 1-7 Giants in prime time. The only thing seemingly on the line in this game is draft position. Sure, tune in for Odell Beckham Jr. and Saquon Barkley if you want. Or turn it on to see if 49ers quarterback Nick Mullens can repeat his success against the Oakland Raiders. Or don’t turn it on and go to the movies, or take your significant other out to dinner, or go to bed at 7 p.m. and start fresh in the morning. Come to think of it, those all may be preferable options. This week: at Chiefs, 10 a.m. This week: vs. Seahawks, 1:25 p.m.